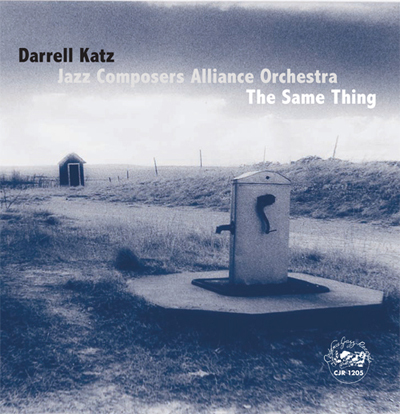 On The Same Thing (August 12, 2008; Cadence Jazz Records) composer Darrell Katz and the Jazz Composers Alliance Orchestra cast a critical eye of the foibles of our times in an album of stinging social satire featuring eclectic, swinging and adventurous music for jazz orchestra that defies genre. Katz, one of the most artful and lyrical composers for voice in jazz, once again showcases the texts of Paula Tatarunis and singer Rebecca Shrimpton’s brilliant interpretations of his musical settings of Tatarunis’ poems. Special guest Mike Finnigan is featured on vocals and organ on the title track. While current events inspire much of the composition’s lyrics, the words provide a scaffold for some of Katz’s most memorable and carefully shaped compositions and arrangements. “December 30, 1994” shows how expertly Katz writes music that follow a poem’s words and meaning. Words and music flow naturally together, the rhythm of a phrase or word dictating the rhythms of the music, while Katz’s orchestration creates varied textures and colors. The larger structure of the poem guides the overall shape of the composition, as well. Sometimes in this emotionally complex piece, which dissects the pathological mindset of a gunman who shot seven people at two Massachusetts women’s health clinics, the music mirrors the darkness and anger of the words, at other times, the beauty and joy of the music contrasts with the text, such as the dancing samba that accompanies the line “words can kill and kill and kill again.” Special guest Fred Ho’s robust, hard-edged baritone saxophone solo and Hiro Honshuke’s capering flute are among the solo highlights. Katz also effectively incorporates collective improvisation as a compositional element in this piece, and in most others on the disc. “I’m Me and You’re Not” is a setting of another Tatarunis poem, an acid satire of the narcissism and entitlement of the self-important. Katz’s score offers scathing commentary on the mock lecture at Center for Creative Sociopathy, taunting it at times, venting anger and exasperation at others. In one comical passage it sounds as if the band is mimicking the childish “nyah-nyah” taunt. One of the composition’s main themes is a deliberately lumbering melody that seems to mock oafish behavior. Honshuke’s use of electronics during his solo adds a touch of menace to the piece. Trombonist Bob Pilkington and guitarist Norm Zocher expand on the music’s ironic distain in their empathetic duet. Two compositions turn their attention to the vagaries of love. “Like a Wind,” a new arrangement of Katz’s setting of a passage from Sherwood Anderson’s novel Winesburg, Ohio, is one of the most colorful arrangements on the disc. Shrimpton sings this sad meditation on the impermanence of love with intimacy and compassion, her voice set off by soft, dark-hued support from the orchestra. Pianist Dan Tepfer injects off-center rhythms, and trombonist Dave Harris, with his big, burly tone, bursts with vitality during their respective solos. Katz’s arrangement of bluesman Willie Dixon’s “The Same Thing” is about as unromantic a look at love as you can find. It features a gritty performance by vocalist and keyboardist Finnigan — an underground rock legend who’s recorded with Jimi Hendrix, Crosby, Stills, and Nash, Taj Mahal and Etta James — and a Maceo-Parker-meets-Albert-Ayler solo from alto saxophonist Jim Hobbs. In a lighter vein, Katz pays tribute to the late Rhythm and Blues giant Ray Charles with “Everybody Loves Ray Charles.” The score offers some gospel-blue big band razzle-dazzle, with bright brass voicings and soulful riffs backing solos from several band members. The call and response between Hobbs and the orchestra assumes a revival meeting fervor couched in a free-jazz vocabulary. Shifting time signatures give the big band conventions a twist to keep things interesting. Darrell Katz is director of the Jazz Composers Alliance (JCA), an organization he helped co-found in 1985. His music is heard on the Jazz Composers Alliance Orchestra CD’s, FLUX (1992, Cadence Jazz Records), featuring Julius Hemphill and Sam Rivers; Dreamland (1992, Cadence Jazz Records); his improvisational cantata, The Death Of Simone Weil (2003, Innova); In Thru & Out (2004, Cadence Jazz Records); and Celebration Of The Spirit (2006, CIMP). I’m Me And You’re Not, by The JCA Sax Quartet, vocalist Angel Gittens, and poet Paula Tatarunis was released in 1999. He’s written over 50 pieces for jazz orchestra. The JCA Orchestra, the Darrell Katz Dreamland Orchestra, the Henry Threadgill Windstring Ensemble, Orange Then Blue, Marimolin, Either Orchestra, and True Colors have all performed his compositions. Since 1985, the Jazz Composers Alliance has supported and promoted composition in the jazz idiom in many ways. Through its resident ensemble, the JCA Orchestra, they have premiered nearly 150 new works by JCA composers-in-residence and guest composers, including commissioned works from Muhal Richard Abrams, Marty Ehrlich, and Maria Schneider. Through the Signature Concert Series, they also have presented works by Henry Threadgill, Dave Holland, Steve Lacy, and Oliver Lake among many others. The JCA administered the Julius Hemphill Composition Awards, an international competition that recognizes innovative work for both small and large ensembles, from 1993 to 2004. In 2001, the JCA instituted the Composers in the Classroom program, sending resident jazz composers into Boston-area elementary schools to help students develop and apply skills in composition and improvisation. Jazz composers from Ellington to Mingus and beyond have all drawn inspiration from current events. Composer Darrell Katz and the Jazz Composers Alliance Orchestra join their ranks with one of their most accomplished and vibrant recordings to date. Also available at Itunes and CD Baby.